In the area of chemistry, a number of different apparatus are required. Without these apparatus, one cannot carry on the process, experiment or research at all. There are two types of apparatus used in chemistry. The first type is regular apparatus, which is useful in any sort of process, research or experiment while the second type apparatus is used in a particular process for a specific experiment only and cannot be used in different processes at all. Jars, beakers, pipettes, burettes, test tubes, flasks, funnels are some of examples of generic apparatus useful in a number of experiments. The lab beakers is such a useful apparatus across the laboratory. It is of a cylindrical shape and possesses a pointed tip on the upper end, which is also known as its opening. It has a flat round bottom. There are different sizes of beakers available in the industry, and, usually, it is available in a few milliliters to liters. Usually, the manufacturers produce this apparatus as demanded by the market and lab professionals. However, they can also be provided as customized beakers as per the demand of the client. The role of beaker in the area of chemistry is so wide that one can hardly come across any laboratory in which this apparatus is not seen. Usually, this apparatus is used to pour such chemical from beaker into another container, which is hazardous in nature or need to be poured when it is hot only. The tipped part of the beaker can help to pour the chemical without spilling it across the surface. 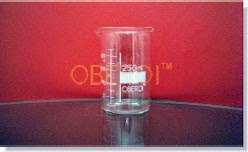 The volumetric beaker can also help to measure the liquid filled into it. It is also equally useful for a number of processes such as stirring, mixing, heating, chilling, holding or taking the chemical to some other location. Generally, these beakers are made of borosilicate glass, which is nonreactive to chemicals. The apparatus made of it can be easy to maintain and clean by simply a gentle wash with clean water. This instrument can be used as a liquid container or hazardous chemical container also as the chemical filled in can be easily viewed, and hence it becomes safe to handle such chemicals. These beakers can also accommodate with change of temperature comfortably. Because of this feature only, it is equally useful for heating and chilling process. They are easier to operate and keep in the laboratory. The beakers also have a beautiful feature of clarity, which is very much required while the process is on. Due to this feature only, beakers have been used in a number of processes across the laboratory all over the world. The flat bottom helps to handle the beaker easily, however, as it is made of glass, by nature it is fragile and so one has to watch while handling it in the lab. Other than this single drawback, the beaker is very useful apparatus in the chemistry lab of different types, and hence it is widely popular. Amazingly describe the Laboratory Glasswares and Equipments, which we should know about. So basically in labs Equipments, safeties and precautions all are required in healthy manner.
. They are very good in their dealership, provides you the best and long-lasting Science Lab Equipments to use in your research labs, college labs, universities labs, or like such other educational organizations.